I have not planned my time during this glorious "Seven Days of the 70s"-fest very well and find myself staring down Friday with no time to write anything. So, slap-dash and with far less thought than they deserve, here are my seven favorite films of the decade (out of the fifty I've seen - I know, only fifty! ), linked to my original posts so you can easily get to some of the thoughts I have but couldn't properly rework for today. Also: in a Desai-style coincidence, this list of 7 favorite 70s films is my 700th blog post. Let's call that auspicious, shall we? I've lost count of how many times I've seen this, and every time I watch it I find new material that seems to comment on traditional vs. modern, Indian vs. western, fantasy vs. reality, submission vs. boldness, introversion vs. truly knowing other people, calculated risks vs. foolhardy danger, ideal female and male types, the question of whether it is really possible to alter your basic nature...the list of Sharmilee's questions and experiments goes on and on. Careful performances by Rakhee and Shashi give multiple layers to characters and cause you to reconsider them continually as the story unfolds. My gut feeling is that I do not actually like the socio-cultural message of the film's conclusion, but I still don't understand what is going on thoroughly enough to say with certainty. 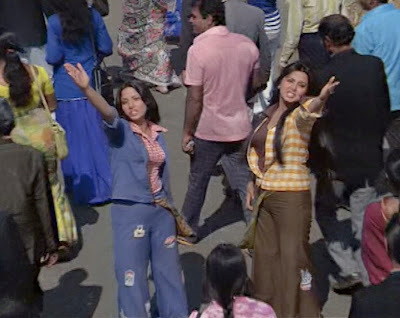 On top of that, it's got one of the most startlingly, jaw-droppingly hilarious moments I've ever seen in a Hindi film. There are several instances of "Wait a sec! Did they just...what?...yes they did!" Sharmilee yanks the rug right out from under you and re-sets conflicts, sending the story tumbling off on another path. And the clothes. What I wouldn't give for a day spent with Rakhee's wardrobe and hairstylist. Not a film for a day your brain or aesthetics have called in sick. What she said. Everything about this is so funny and nobody lets it go too far. How often can you say that! Clever and funny and full of heart (literally!). 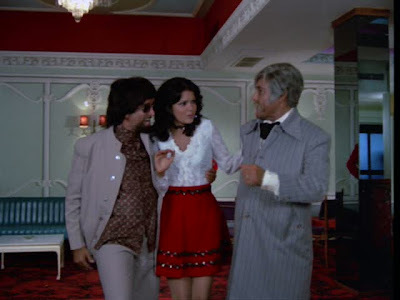 The lead ensemble of Shashi, Zeenat Aman, Ashok Kumar, Pran, and Deven Verma is unstoppable in all its configurations. For us Shashi fans, it's a treat to again see him demonstrate his skill at sharing the screen; however, he also has a gloriously silly ten-minute one-man-show as his character Bholanath adeptly baits and reels in a con. In it, Shashi produces the finest comic acting I've yet seen from him, a frantic blitz of lies and faked melodrama making full use of his confidence, charm, proclivity for emotional breakdown, the smile behind the called-for expression, and The Voice. The film's only problem: as almost always, I wish there were more female characters of substance. At least the one who is there (Zeenat's petty thief) gets to do almost as much as anyone else. This one is such a blast that it almost defies description. It's funny in all the same ways its source material (Some Like It Hot) is, sagely adapted and tweaked ever-so-slightly for Bollywood tastes and the talents of its stars. Centering the silliness on the two cutest Kapoors (okay, one Kapoor and one Kapoor-to-be) doesn't hurt either. Heaps and heaps of vah vah to everyone involved in this! It baffles me that this is not more people's favorite masala film. It has absolutely everything from the masala checklist (and then some), expertly selected, crafted, executed, and combined. Compared to coincidental familial, demographically-balanced blood transfusions, it's even downright subtle at times. You want a tricked-out bad-guy hang-out? We have two - one has quicksand and dancing girls and the other is its own vehicle. Orphans? We've got three. Thief/cop family drama? Done. Disguises and hidden identities? Sure. Revenge? Socialism? Blindness? Qawwali? Oversized cardboard cut-outs of famous landmarks of India? But of course! Sanni is doing a stellar job at outlining its awesomeness this week (starting here), so please read her posts if you still have any doubt whether Parvarish is worth a watch. One of the most impressive aspects of this film to me is that it has not one but two really well-written, interesting, dimensional female leads (who, as sisters, fit the title's theme just as much as the hero brothers). These women are every bit as tough and crafty as Roma in Don and successfully balance their hearts and their heads - while being tongue-in-cheek socialist! Director Desai, writing team Prayag Raj (a masterful genius about whom I would like to do a whole post at some point), Kader Khan, and K. K. Shukla, the stars, and Laxmikant-Pyarelal have all turned it up to eleven on this one. Again, nothin' not to like here. Who let Desai and crew (including Raj and Khan on writing credits again) loose in the world's most questionable costume shop? Who cares! Dharam Veer is confident enough to both flirt with the risqué and indulge our brother-loving hearts, and it's full of different kinds of affection, sassy princesses, arena sports, and blistering sarcasm from Dharmendra. It may be coated in ridiculous ruffles - lots and lots of ruffles - but has bite and heart at the core. So serious compared to all but my first choice - and the only Salim-Javed on my list - Kaala Patthar grabbed my emotions and wouldn't let go. Big questions are dealt with but it never feels like "an issues film," as in the scene above, where the battle between community good and individual ego can only be reconciled by the figure who is slightly removed from the surface condemnations but gets his hands dirty in order to get things done. The story is full of conflicts and genuine peril - there's nothing mellow about this drama. It could even be viewed as environmentalist: humankind's quest for fossil fuels, representing not only the literal resources but the wealth that they enable and tempt, becomes so dangerous, so megalomaniacal, that nature hovers waiting to see if anyone will listen and then deciding to punish the transgressors and re-set the balance. The coal dust covering almost every surface in the set perfectly suits the gray shades of emotion and ethics. With bed rest, I have been able to watch all my 70's films in spirit, and I've been watching these films for the past few days! Parvarish is an absolute king in the Masala Pradesh, with hilarious hijinks and very girl power-eque sisters, i was sold as soon as i saw it. But it had me at the wonderful den that Amjad inhabits! 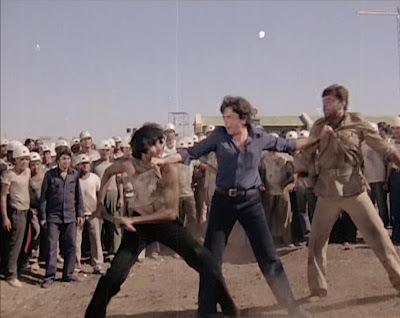 And Kaala Patthar is just an excellent reworking of all those silly disaster films in the 70's at the same time, except i think its hollywood titles would be "Masala in the Mines!" But that superb fight between AB and Shotgun is just wicked! Attempting to participate in 70s week has only whet my appetite for more. I will be sure to continue using this list as my guide! As Christy said, I'll be using this post as a guide for the future exploration of the 70's. By the way, Beth, thank you for the 70's week idea. It really gives perspective on the golden years of Bollywood and allows the clueless newbies (aka me) to pick and choose the best there is. Rum - Thank goodness something nice has come out of your injury! Amjad's den is indeed a masterpiece. Very creepy but also oddly inviting with plush carpet and houseplants. Plus ensuite bedroom! Nirvana - It's like we saw completely different films! 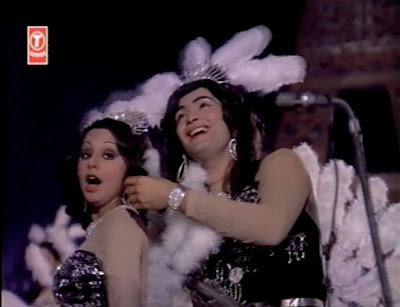 bollyviewer - I do indeed (and tweeted as such last night) :) I figured some people might be surprised that there isn't more Shashi on the list! anon - Saw it! So fun! I can't believe I have only watched the first two from this list. Sad. I need this Bollywood masala movie watching time. I am SO with you on Kala Patthar- I love disaster movies, and this was the best ensemble cast. Granted, Shashi got rediculously lil screen time, but it is close to perfection. I have not seen Rafoo Chakkar and I consider that a serious lack in my education. Apart from Dharamveer, I agree with all your choices. Sharmilee is such a lovely film. I just adore the scene where the spunky Rakhee tries to steal food from the officers mess. She also looks her loveliest ever here. The songs are my faves too. Esp the title song - O meri Sharmilee.